This recent book is written by an anthropologist and examines the strange, virtual, tribe of people who call themselves ‘Anonymous’. The second chapter, which is entitled “Project Chanology – I came for the lulz, but stayed for the outrage” covers one of the earliest real-world campaigns undertaken by this online collective – its attack upon the Church of Scientology. It does so in loving, accurate detail, and includes the contribution of ‘Wise Beard Man” (aka Mark Bunker) which helped to make the mass protests so effective. The involvement of Anonymous has had a profound influence on the culture of those who campaign against the Church of Scientology. It demonstrated how a groups of like-minded individuals, using anonymity and the Internet to work together, are more than equal to a inflexible bureaucracy like Scientology. 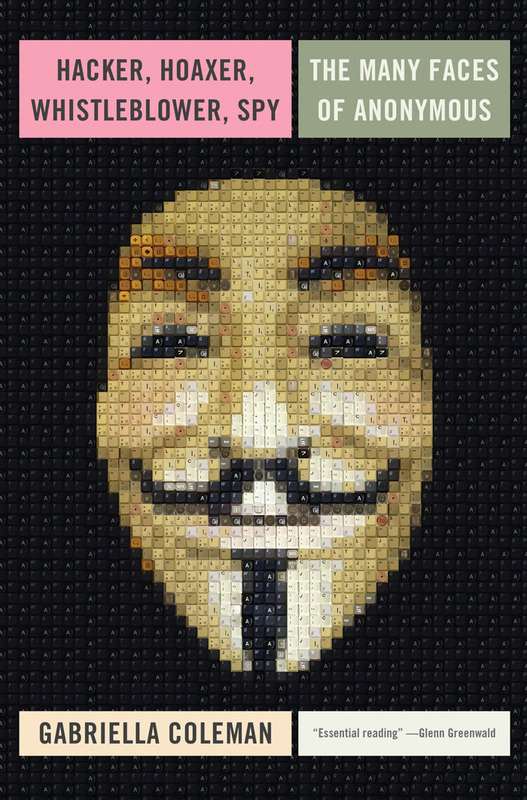 However, as the book reveals, its involvement in the campaign against Scientology changed Anonymous just as much – from a group of uber-trolls to iconoclastic social campaigners. This is a fascinating read for both Anons and ‘Old Guard’ critics of Scientology (who must have wondered where these strange, masked people came from, and what they were up to). 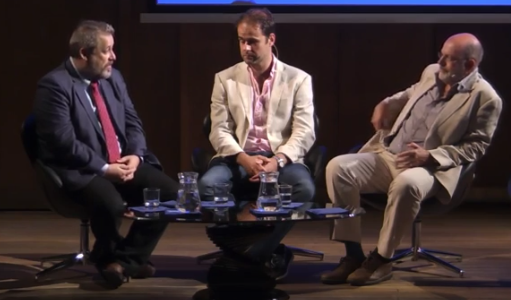 At a presentation yesterday in the Conway Hall in London, Tony Ortega dropped the bombshell that Sky Atlantic will broadcast the Alex Gibney documentary film “Going Clear: Scientology and the Prison of Belief” in the UK in September. This has subsequently been confirmed by the BBC. The broadcast of this documentary film had previously been postponed, apparently due to doubts about whether Sky would fall foul of the more repressive libel legislation still in force in Northern Ireland, and be sued by the Church of Scientology. It seems that Sky (which cannot exclude Northern Ireland from its coverage) has decided to call Scientology’s bluff. 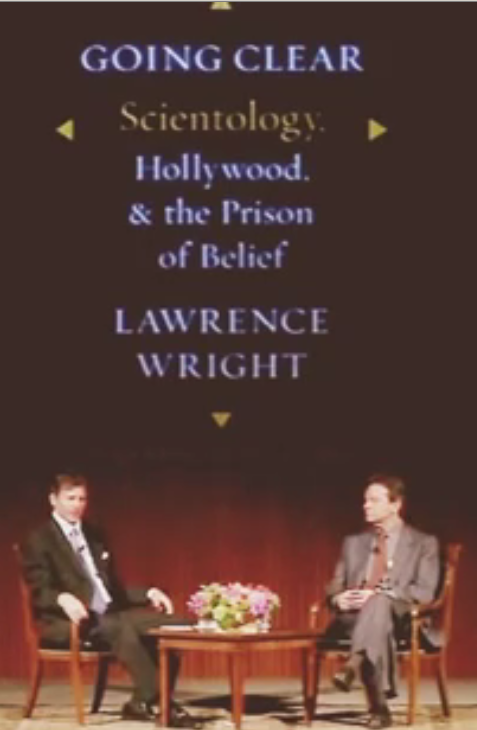 Ortega (on the left) is an investigative journalist who writes the best blog about Scientology and appears in the film as an expert on Scientology. He knows whereof he speaks. This presentation was fascinating in itself and there is more about it after the break (including the video). However, before we move on, I would like to appeal for information from readers. Before the UK broadcast of “Going Clear” was postponed, the Church of Scientology launched a media blitz. They promoted their front groups in full-page ads in publications such as “The New Statesman” and “Metro”, on social media and electronic billboards. The advertisement in “The New Statesman” regarding ‘Volunteer Ministers’ was the subject of a complaint to the UK Advertising Standards Association. As a result the Church of Scientology agreed not to present VMs as if they were a relief organisation in future. The Church of Scientology is unlikely to let the broadcast go without some media response – which may break their promise to the ASA or lay them open to complaints on other grounds. 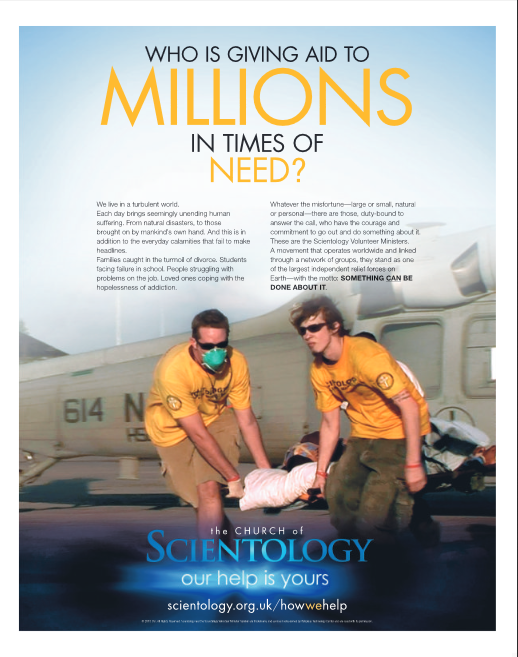 If anyone in the UK sees an advertisement, especially in a newspaper or print periodical, promoting Scientology front groups please let me know about it in the comments, or via the feedback page. “The Unbreakable Miss Lovely” also deals with this period, but from a new perspective which adds considerable depth and a human dimension to the story. 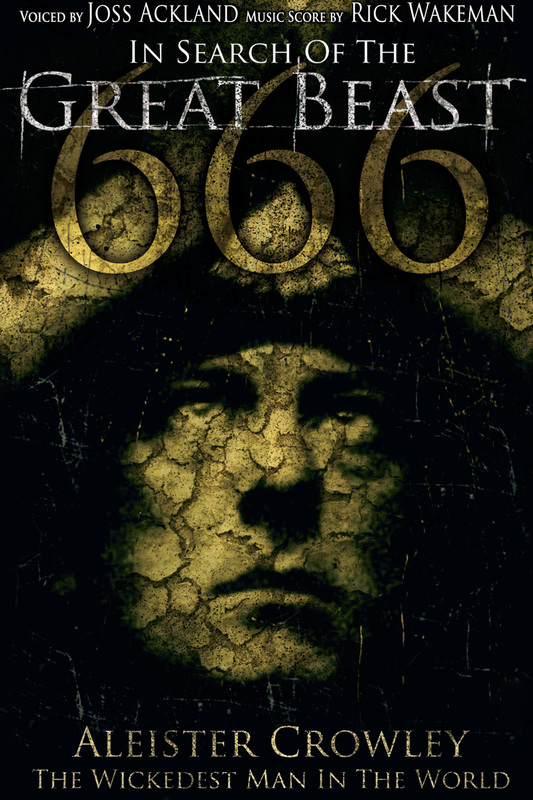 Its subject is Scientology’s treatment of a journalist (Palette Cooper) who published a book critical of the Church entitled, “The Scandal of Scientology” in 1971. After her book appeared, the Church of Scientology subjected her to an organised programme of persecution. This included a libellous (but anonymous) smear campaign, endless litigation, the tapping of her telephone, being ‘befriended’ by undercover agents and being framed for sending letters containing bomb threats. After many years of legal action the Church succeeded in obtaining the copyright of her book and suppressed it. Nevertheless, you can download and read it here. All of these operations (and more) were undertaken by the Church of Scientology’s ‘intelligence’ branch (which still exists and operates today, under a different name). While it was persecuting Cooper, the “Office of the Guardian”also infiltrated multiple US Government premises, where they copied (and planted) documents which they thought could be used to their advantage. This bizarre espionage story is extensively covered by Ortega, not least because it had unexpected consequences for the subject of his book. “The Unbreakable Miss Lovely” (A New book by Tony Ortega) Announced. Do Publishers No Longer Fear the Church of Scientology? Tony Ortega is a investigative journalist who has written extensively on the subject of Scientology in (almost) daily blog posts over a period of years. These began in the Village Voice. In 2012 he resigned his position as editor of the Voice to “[…] pursue a book proposal about Scientology in its time of crisis”. He continues to post daily on his own site The Underground Bunker. Ortega recently announced the publication of a book he has been working on for the past two years. 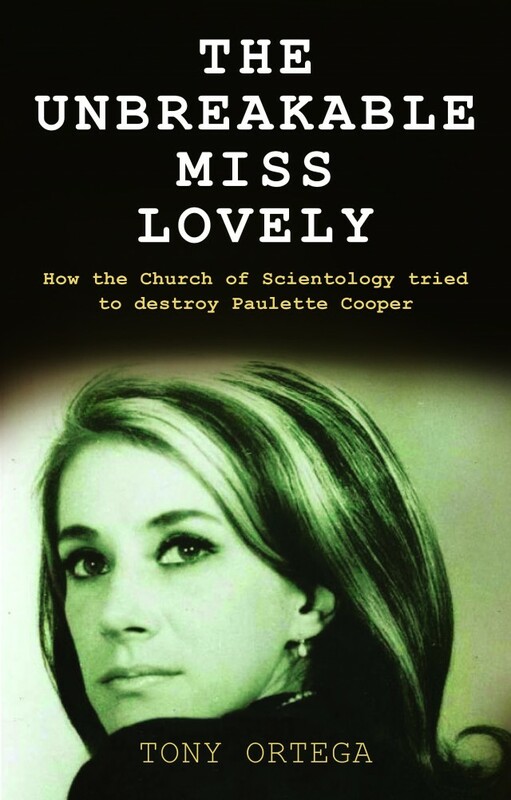 It will tell the story of the extraordinary persecution of fellow Journalist Paulette Cooper by the Church of Scientology’s ‘secret police’ after her critical book, “The Scandal of Scientology” was published in 1971.| Read Online | Download as .pdf . This site began as an attempt to compile a comprehensive and up-to-date list of books examining Scientology from an academic and critical perspective. It branched out partly because I was running out of books. However, now and again, an overlooked but very valuable text turns up – and this is one such. The book begins by using the work of Thomas Kuhn and Karl Popper in the philosophy of science to clearly draw the distinction between real science (specifically psychology) and pseudoscience.